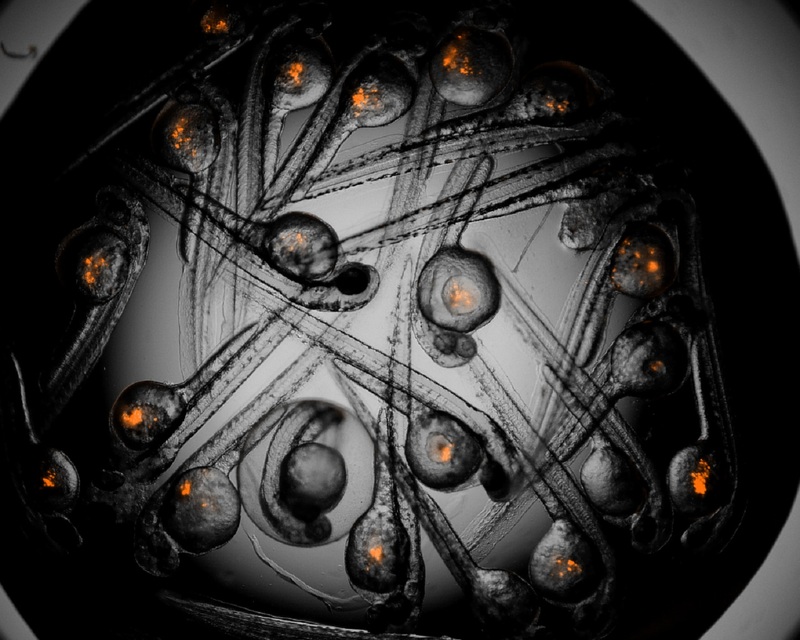 Zebrafish embryos have been used to perform xenografts for modeling human cancer since 2006 due to his lack of immune system, transparency of their bodies and low maintenance cost. Xenotransplantation consists basically on injecting cells from one donor organism to another different organism. In our case, we have focused our efforts on the field of the molecular medicine and we work injecting human cancer cells in the zebrafish embryos. This technique allows us to test the behavior of the injected cells (all kinds of cell lines, cancer stem cells…) inside the yolk of the zebrafish embryos and, apart from that, test different chemotherapeutic compounds to find out what is the effect of those drugs upon the injected cells in a short period of time. We are able to incubate the zebrafish embryos at a temperature of 36ºC with high survival rates at 72h and a little less survival for trials up to 96h. This is very important because is a temperature near to the human body where the cells are able to proliferate. Cell lines: any kind of cell line is susceptible of being injected on a zebrafish embryo to test the behavior of the cells inside the fish. Examples of characteristics we are capable of quantify: proliferation and reduction of the cell mass, migration of the injected cells and their interactions with the microenvironment. Primary Tumors: moving closer to the personalized medicine we have the primary tumor injections. This kind of cells are called primary tumor because the way to obtain them is getting a biopsy from a patient and making a primary culture of those cells in vitro. Afterwards, those cells are injected on the zebrafish embryos and some chemotherapeutic compounds can be tested in order to find the best for the patient. Cancer Stem Cells (CSC’s): cancer stem cells are a small subpopulation of the primary tumors and can be found in the cell lines in minor quantity as well. Those cells have a special characteristic: they can form a new tumor by themselves. They are the precursor of the whole subtypes of future tumor cells and responsible of the spread and migration of the initial or primary tumor and the following metastasis in distant organs. Those cells can be injected in the embryos to check their ability to form tumors and metastasis with only a few cells or even test their relation with the microenvironment (fibroblasts, macrophages…) and their chemo resistance to the most common drugs. This organism model allows the test of multiple chemotherapeutic compounds simultaneously in a short period of time (days) on the cells injected on the embryos in order to find out what is the best compound or combination of compounds against a specific type of cancer. This can be done because of the advantages of the zebrafish embryos: they spawn in large number, so the N of the experiments can be huge (allowing us to have a high N for each compound); and on the other hand, zebrafish embryos are permeable for most of the compounds through their skin. This objective can be achieved with the administration of specific doses of the compound to the water where the fish are being incubated. In this way, we are able to select the best combination of drugs and the percentage of effectiveness upon the cells injected with a robust statistical analysis. Image analysis is one of the most important tools for our work regarding the xenografts. This is because in order to quantify the proliferation or reduction of the tumor mass inside the embryo, and due to their transparency, we need to take a photograph of the embryo at the time the cells are being injected, and another one some days later to compare the two photographs and try to establish whether they have proliferated or reduced. Many years have passed since the first xenograft in 2006, but the quantification of the injected cells has always been a challenge. Many authors have applied software like Photoshop CS4 and ImageJ to give a proliferation approximation. Nowadays we are working with our own image analysis software: ZFtool. This software is being optimized to fit the requirements for the xenotransplantation assays. They need to be accurate enough to give a reliable result, above all when we are working with patient cells. Because of that, we are trying to calibrate this image analysis software and developing some additional functions with the collaboration of Maria José Carreira (Citius, USC) establishing a proliferation and reduction ratio using cell lines and afterwards we will be able to try some primary cultures.